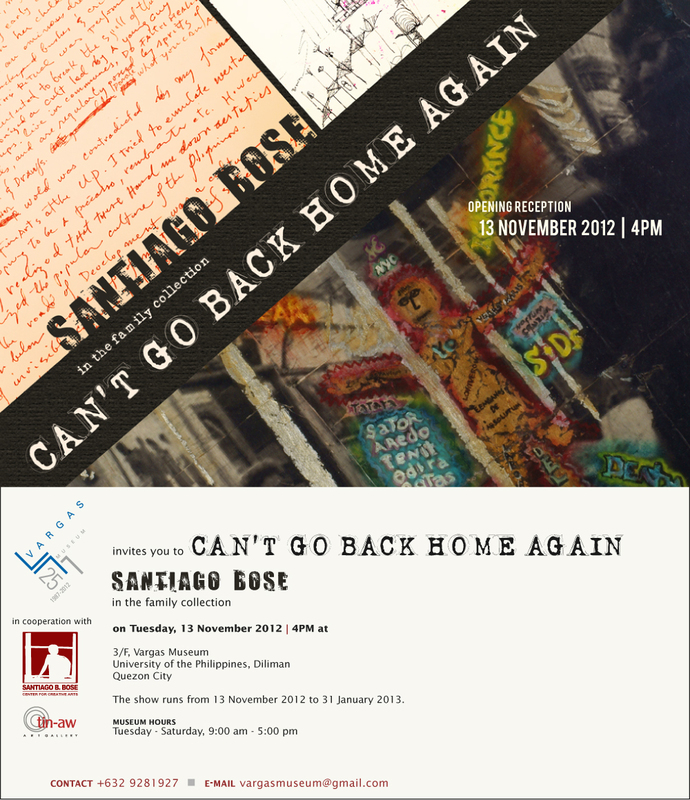 For the commemoration of Santiago Bose’s 10th year death anniversary, Can’t Go Back Home Again, Santiago Bose in the Family Collection brings out artworks, illustrated journals, footage of interviews, and documentation from the collection of Bose’s family. 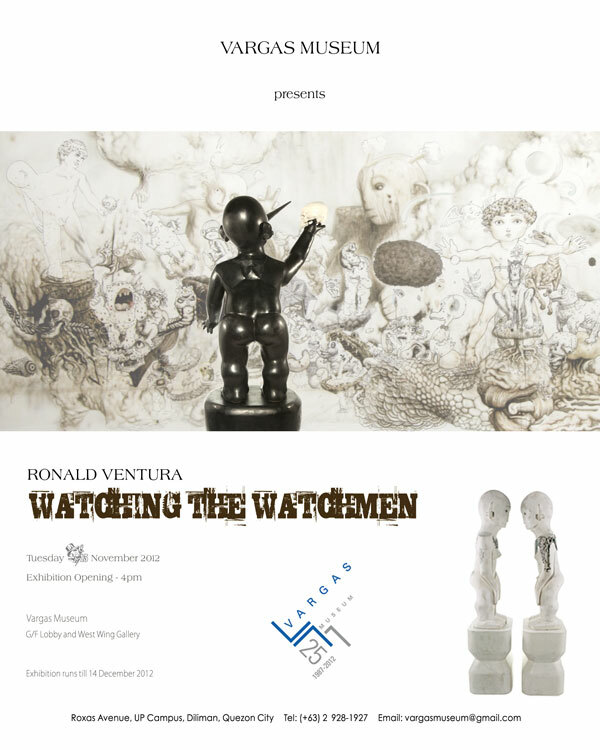 This is his first exhibition at the University of the Philippines where he took up Fine Arts. A Visayan word synonymous with keepsake, memory, and remembrance, Handumanan evokes images, sites and places, people, and stories of the Visayan region through a diverse gathering of works by contemporary artists from the Visayas, ranging from drawings and paintings, to photographs and video works. Conversing with these artworks are selected pieces from the archives and memorabilia collection of Visayan-born Jorge B. Vargas, featuring literature, folklore, maps, and ethnographic accounts of the region, as well as dictionaries and prayer books in various Visayan languages. Drawing On Board is an installation and performance art project by Coquilla. A salvaged one-piece jeepney overhead suspended from the ceiling of the gallery serves both as his drawing board and installation piece. Inspired by his previous top view or “tingala” paintings about everyday life and street culture, it engages the audience as they gaze up to see the work and their own reflection in mirrors attached to the board. The viewers then become the subjects in this situation while they mirror the people depicted in his “tingala” piece. Furthermore, Coquilla shows his fascination with multimedia techniques by documenting the art process, consisting of a sequence of drawing sessions, with a time-lapse record of work in progress from October 1 to 10, which is open to the public as part of the performance. Bliss Market: Exchange in Time | Space of Transience gathered together a diverse set of artists tasked to intervene in U.P. Bliss as space and community, currently in the throes of neglect, constantly being reimagined by memory and nostalgia. A project of J Pacena II, Bliss Market takes the central symbol of the old Bliss Mart that used to be grocery and community center of the U.P. Bliss of his childhood. Now just structural ruins, the Bliss Mart is not only memory but also fact: here lies a vestige of a community that could be brought together by common spaces of exchange, both literal and figurative, neighborly and otherwise. That this isn’t true anymore, different as the landscape has become, where childhood leisure has become more about staying in instead of inhabiting the outside, and the individual has rendered community less important, is the current state of U.P. Bliss. Jose Legaspi presents a suite of small drawings and two large portraits in his continuing reflection on how it is to intuit the structure of feeling for the self as revealed in a particular state or stance and amid the hectic details of visions of the world. Not so long ago, Alice and Lucinda became conspirators in alternative self-representations via D-I-Y operations whose works take place in the social realm of urban Manila and the lo-fi art community. Yasmin Sison and Lena Cobangbang are co-generators of ideas in the state of perpetual flux in the days of Generation X, indie pop and alternative icons. Together, they create the alias “Alice and Lucinda” and their debut exhibit The Incredible Lives of Alice and Lucinda took place at Surrounded By Water in Angono in 1999. A coinciding exhibition at mo_space with emerging artists Catalina Africa and Maria Jeona Zoleta (March 20 – April 15) ran simultaneously with this exhibition, where new post-feminist art found itself in an expanded field of artistic practice. This exhibition focuses on the convergence between the museum’s milieu and the artist’s sculpture. The inspiration of this project is Saluysoy, Robles’s retrospective held last year, which means “wellspring”. Tagalog at Taga-ilog explores the resonance of the term through sculptures, maquettes, drawings and poetry in the wider discourse of identity and landscape. Archival photographs from the collection of the Sentro ng Arkitekturang Filipino probe the building projects initiated by the Marcos regime in Revisiting Modernity to project an image of progress and national renewal. Through various images, the exhibition presents how the Marcos administration consciously utilized state architecture to legitimize its authoritarian regime and propagate the myth of modernity among its subjects. Salvador utilizes everyday and industrial materials such as bowls, bicycle gears, stainless steel pipes, utensils, and discards to form musical instruments. Wanting to own a guitar, he improvised his first stringed instrument when he was a teenager with meager resources. This innovation has become part of his life-long artistic process. Carefully composing these elements to craft pieces that are both decorative and modern, the artist distills the notion of the everyday by reconstructing seemingly banal objects into new forms, translating their meanings.